A painting may be created to replicate nature, to liberate emotion, to explore an idea or to redefine identity to hasten social change. Arguably, the Australian painting vernacular has done this more effectively that the vernacular of any other nation. While Australia has not produced a Paul Cezzane that has shown a new way conceiving a bowl or fruit, or a Pablo Picasso that created a new art style that revolutionised an attitude to painting, it has produced countless artists who have used art to change the way their country is thought of. The most influential paintings have blended history and the harsh nature of the landscape as a way to personify positive or negative viewpoints upon the people that interact with it. The intention of the first known Australian artists is somewhat of a mystery. In North Australia, the relics of their work could be legitimately described as one of the seven wonders of the ancient world. Known as the Bradshaws or Gwion Gwion, the art is dispersed in around 100 000 sites spread over 50 000 sq. km of northern Australia. Because they are so old, they have become part of the rock itself, which makes carbon dating to find the exact age impossible. 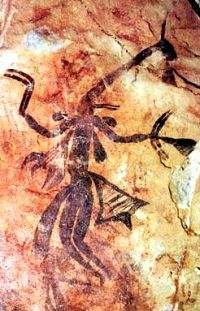 Although the art's pigment can't be dated, a fossilised wasp nest covering one of the paintings has been dated at 17,000 + years old. This makes the art at least four times older than the pyramids of Egypt. A peculiar feature of the art is that they show people with tassels, hair adornments, and possibly clothing. Such body adornments are usually only found in agricultural societies that have developed hierarchical systems of status; however, agricultural societies were not believed to have originated until 10,000 years ago and never in Australia. At more than 17,000+ years old, the Bradshaws are unusual because instead of having animals as the chief subject (like other paleolithic artists), the Bradshaw artists showed humans. While the art of the Bradshaw people survived for tens of thousands of years, the art of the people at the time of European colonisation was usually more ephemeral. Typically painted on sand, bark or the human body, the whole tribe was the canvas and there was little separation between artists and art consumer. The visual representations were combined with song and dance to weave history, mythology and the geography of the land into a whole that is greater than the sum of the individual parts. For example, they may have given directions to a billabong, an account of an historical encounter with another tribe or depicted a mythical man turning into a kookaburra during the dreamtime. Such paintings offered value to hunters, people on walkabout as well as the storytellers entrusted to communicate the essence of the tribe's identity and the individual's place within it. They also made each individual feel that they were of the landscape, the environment and a community. The body is the canvas; Arrernte painting for public corroboree - 1901. When European artists arrived in the 18th century, they brought with them the traditions of the "old" world. The likes of Eugéne von Guérard and Nicholas Chevalier tended to paint what they saw and the value of the work was principally in its aesthetics qualities. 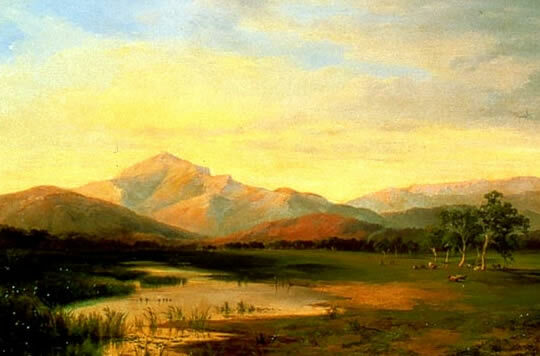 Like most artists, they strove for a sense of uniqueness and they tried to find it by painting the Australian land; however, despite being technically skilled, most of their early paintings neither captured the look nor the feeling of the Australian landscape. Specifically, the Australian land is messy and random; the trees are twisted with the chaotic look of an old lady's broken fingers, the bark hangs like a poor child wearing the well-used hand-me-downs of an older sibling and the earth is littered with leaves and old branches. Furthermore, because the topsoil is thin, it reveals the immense history of the earth; its faults, its fossils, its bones and its sediment. The colours are dull and contrast is slight; however, with this dullness, comes great complexity of colour. These unique characteristics were not conveyed in the Europeans' paintings. Instead, the paintings looked and felt more like the French Alps or the rolling hills of Ireland. The Europeans used deep colours of monotone green that made Australia seem new and fertile and deep blues in conjunction with white to create feelings of contrast. Some artists even tried to further emphasise the uniqueness with a few naked Aborigines include for token value. Unfortunately, they made Aborigines look more like black Romans who forgot to put on their tunics. Nicholas Chevalier - Buffaloe Range from the West. Early colonial artists accessed their European training in art to depict Australia like Europe, not how it actually looks. One artist who did manage to attain a sense of regional definition was Convict artist W.B Gould but rather than find his uniqueness in the land, Gould found it in the people. 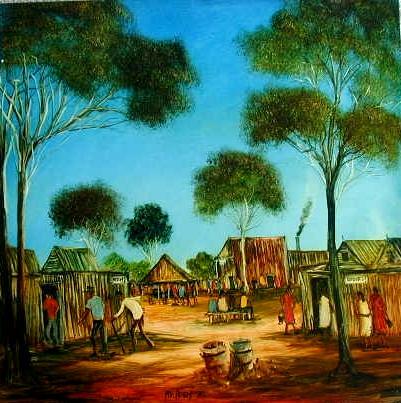 For example, his painting "The landlord" offered an insight into the origins of Australia's larrikin personality. It depicted a suited man with a toothless grin. Strict convention amongst noble man of the time was a deadpan expression; especially if one's teeth were missing. Without doubt, Gould had painted an ex-Convict whose desire to conform to social prestige had been surpassed by a self-effacing personality. By painting a man with a toothless grin, not only was Gould changing the conventions of portraiture, he was also redefining those values associated with success. W.B Gould - The Landlord. At the time, social convention demanded that subjects have a deadpan expression when posing and if one's teeth were missing, convention would be to keep one's mouth shut. Gould showed the beginnings of an egalitarian personality by painting an ex-Convict made good and who didn't care about convention. Towards the beginnings of the 20th century, a cultural tradition was developing that led to the creation of the Heidleburg School. Within the school, a group of painters dealt with a common subject matter and learnt from each other, yet still produced completely individualistic results. Such painters included the likes of Tom Roberts and Arthur Streeton who captured the chaos and complexity of the land and wove into it the prevailing themes of nationalism and independence. Their paintings convey optimism with hill top gazes filled with vibrant blues and subtle yellows and their subject matter included the pioneers whom were pushing the bush frontiers. 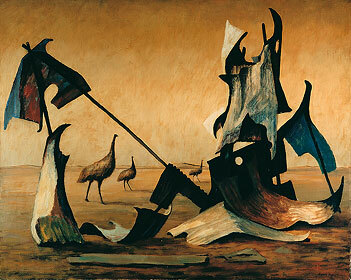 With an optimistic subject matter and an aesthetic that matched the complexity of the landscape, the artists of the Heidleburg School were able to position the bush landscape as the personification of the uniqueness and strength of the Australian character. 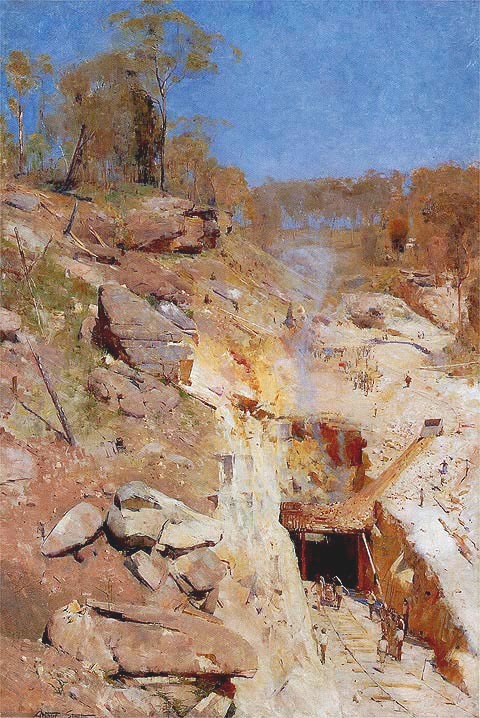 Arthur Streeton - Fires On - Today, glorifying a mine would be somewhat of a taboo subject in the arts but Streeton did precisely that with a painting that seemed to encapsulate humanity's power to dominate the landscape. Also painting the pioneers was Frederick McCubbin; however, unlike Roberts and Streeton, McCubbin's themes tended to be melancholic. McCubbin painted thick bushland where light was dim and the environment seemed somewhat lonely and dark. 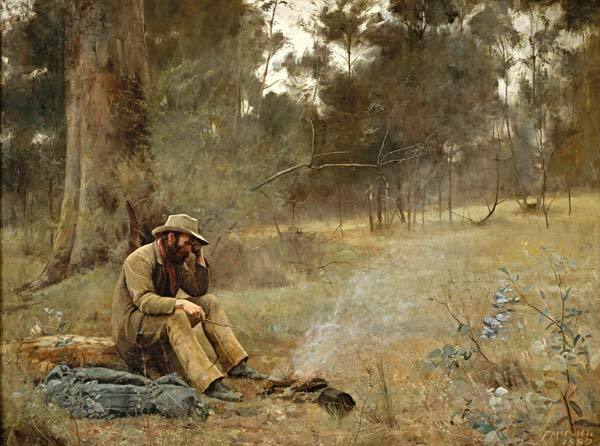 Into the scene he would introduce a pioneer but, rather than optimistically showing the pioneer conquering nature, McCubbin showed them being conquered themselves or using the bush as their refuge. In other words, no sooner had a nationalism based on mastering the bush been created, it was being subverted by another artist with a different take. Frederick McCubbin - Down on His Luck - Whereas other artists showed the pioneers conquering nature, McCubbin showed them being conquered by it and/or using it as a refuge. Whereas the pre-war years had been dominated by artists from the Heildleburg School, the post-war years saw a group of mostly self-taught artists from outside of the art schools take over. The chief group among these were the Angry Penguins, which included the notable names of John Perceval, Arthur Boyd, Sidney Nolan, Albert Tucker, and Charles Blackman. 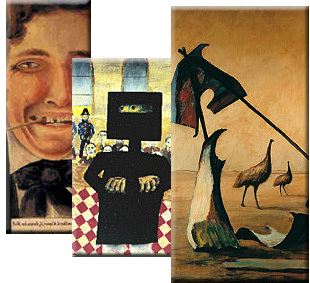 The Angry Penguins felt that Australian art and Australia itself was far too restrictive and their aim was to modernise it with the psychological power of surrealism and expressionism. Where the group differed from European and American expressionism was the infusion of a cerebral concept to compliment the desire to liberate the emotional power of a subject via abreaction. 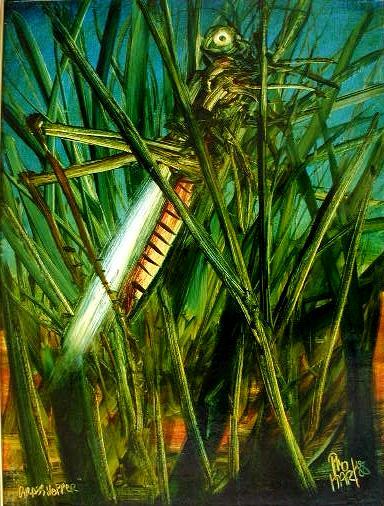 Albert Tucker’s works were perhaps the most disturbing of the groups. Tucker painted decaying carcasses of animals killed in a drought yet even in death the animals do not find peace; they loom large at the beholder as if they are the mutant remains of the apocalypse. In addition, Tucker depicted the darker side humanity - showing fear, trauma, anxiety and struggle. It was this disturbance that in turn laid the groundwork for new forms of thinking and awareness. 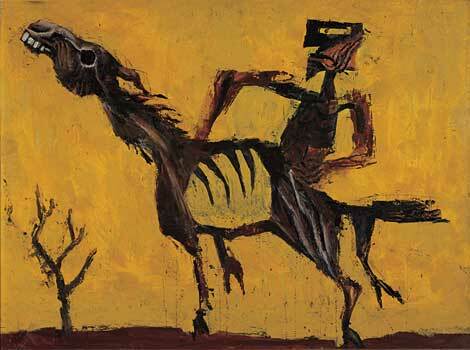 While Tucker was perhaps the most psychologically confronting, Sidney Nolan was arguably the most influential. Nolan became obsessed with myths; the most notable being the legendary bushranger Ned Kelly. Nolan painted Ned as a comic book character, a magician, a leader and a martyr. He blended into Ned the images of the landscape and even titled the paintings with newspaper commentary. Whether Kelly was a good man or bad was always ambiguous, and therefore contributed to the intrigue in his work. "It was a continuing shock to watch somebody with a name like Nolan more or less validating Nedophilia with a series of paintings of the wretched horse thief and cop killer." 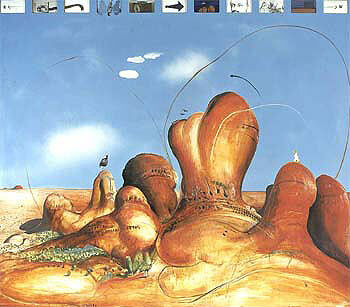 Along with the Angry Penguins, another self-taught artist, Russell Drysdale, started redefining the frontiers of society. Drysdale's work is interesting to contrast to the optimism of previous pioneering artists. His paintings depicted towns that had been the pioneering dream but were now laying desolate as the frontier shrank back into nothingness. Specifically, they depicted dilapidated iron structures that seem so fleeting in comparison to the eternity of the landscape and the native animals that have inhabited it since time immemorial. 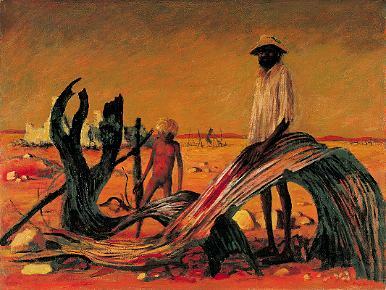 If appreciated in a historical context, Drysdale's works were not mere depictions of the outback; they recorded Australians changing their attitude towards their identity. Rather than depicting the bush as the place of opportunity, Drysdale's works record of a time when Australians began seeing the bush as a place of broken dreams and hence, began to look elsewhere for their heroes. Ironically, while the market was accepting Drysdale’s vision of a dying outback, it also started accepting visions by Aboriginal artists that positioned the outback as a landscape of immense spirituality. 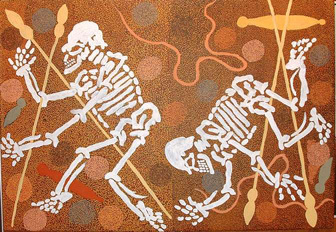 The most notable style was the dot painting, which was invented in the 1970s when a white school teacher north of Alice Springs, Geoffrey Bardon, encouraged Aboriginal children to use acrylics to paint a mural using traditional body and sand painting techniques of their culture. The new style quickly spread amongst Aborigines in the region and produced great names like Clifford Possum and Anatjari Tjakamarra. Dot painting then spread Australia wide. Pro Hart was another outback artist who found an eager audience in the cities with a return to an optimistic vision of the outback landscape. 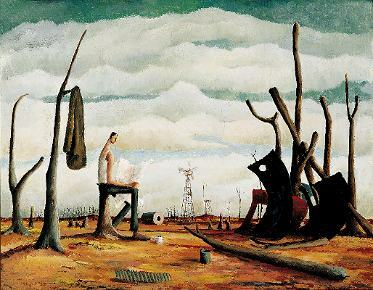 Instead of depicting the outback as a wasteland, Hart depicted it as a place of environmental and cultural beauty. Hart painted miners who were not dependant upon farming for their survival and who had therefore been spared the destructive influence of droughts. Because Hart did not see the outback as a place of broken dreams, he was able to convey the beauty of blue skies, parched land and gum trees. He painted people happily walking their dogs, and egalitarian bars open to the outback air and all those who wanted to join. Although Hart had a profound influence on Australia, it was on his outback home of Broken Hill where the change was the most pronounced. When he started his career, Broken Hill was a hard-drinking mining town. By the end, pubs had been converted to art galleries and a town of only 30,000 people was supporting up to 100 professional and semi-professional artists as well as over 30 private galleries. Although most Australian art has used the outback as a source of inspiration, it is a subject matter that most Australians have little familiarity with considering that 84 per cent of Australians live in a coastal catchment. 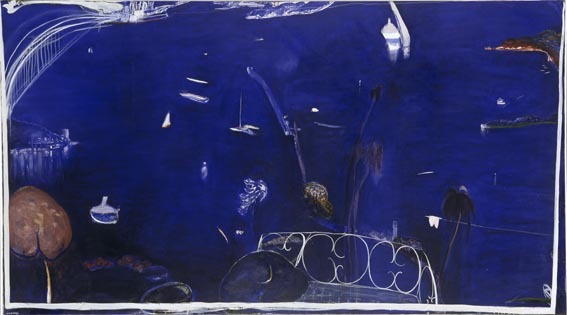 Brett Whiteley is one of the artists that used the coastal environment as his inspiration. "rather like Slim Dusty being compared to Mozart." "He is one of the most delightful illustrators of the Australian folk idiom, but let's not use the word art anywhere." Contrast the two paintings below and come up with suggestions for the different audience responses.